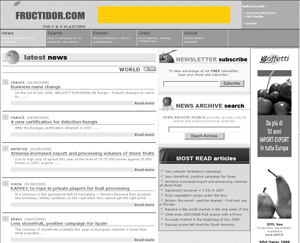 Mrs Ghetti Emmanuela : "I have booked a button on the website fructidor.com. 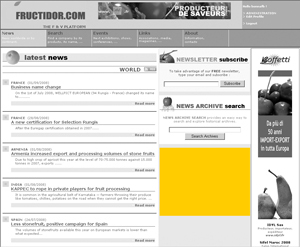 On the same day or the day after, I received calls from professionals who have seen the advertisement on the fructidor website. I've never seen results as fast! Also, prices are cheaper than your competitors!" 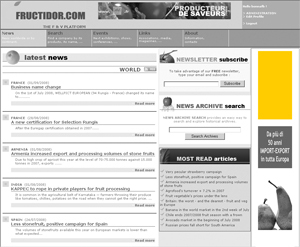 Thaïs & Fréderic Marie : "We were co-exhibitor on the fructidor.com stand for the first time in Berlin in February 2011. Our impressions are very positive. They are very competent and professional team that supports its co-exhibitors right until the end of the exhibition. Good organization, good atmosphere and very friendly, too". Sizes for all budgets and results ! Access all information from the "Bible" of fruit and vegetable. As a subscriber, you will have access to all contact information and you can get in touch with more than 18,000 producers, importers, exporters, buying groups, wholesalers in fruit and vegetable, from 138 countries worldwide. Information updated on a daily basis. All information in the guide is updated every day by our editors and trade team in the field. The opportunity to respond to Purchase Offers. All Purchase Offers are validated by our services. Subscribers can respond, knowing the details of the product search and all the important information about the buyer. Every day services and tools to expand your business. Classified ads, dictionary, travel tips, news, events they are accessible to subscribers who also receive the paper directories.